This exciting toy is strung on a chain with layered pieces of natural vine, coconut and java wood. 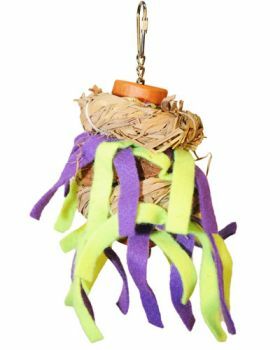 Brightly colored felt fabric in sunny yellow and cherry red are tied throughout the toy just waiting for your bird to pick and pull at. Notify me when Sm Tickles-AE Java Wood is in stock.